Within the compact city centre you'll find unique attractions, top class entertainment - and quality shopping with a difference. Cardiff, the Capital of Wales. Within the compact city centre you'll find unique attractions, top class entertainment - and quality shopping with a difference. Innovative architecture sits alongside historic buildings, the bustle of the city centre is only a few strides from acres of peaceful parklands, and Cardiff Bay offers indoor and outdoor entertainment for everyone. Cardiff Docks as it was then called was the world's largest coal exporting port it is also Europe's largest waterfront development and it has a wealth of leisure activities available both on and off the water. Cardiff Bay is home to a number of attractions such as Techniquest Science Discovery Centre - ideal for all the family, Craft in the Bay, The Welsh Assembly at the Pierhead, Butetown History and Arts Centre, Goleulong 2000 Lightship, the Norwegian Church Arts Centre and the brand new Wales Millennium Centre, a stunning and international arts centre. The Atlantic Wharf Leisure Village provides further options for family entertainment. 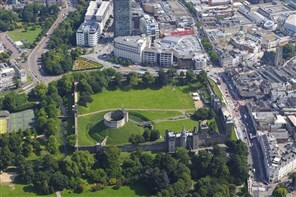 Cardiff may only have been a city for 100 years, but there has been a castle here for nearly 2000 years. Tours of the castle interior take place throughout the day, or visitors can just enjoy a stroll around the picturesque Castle gardens. The newly opened £6m Interpretation Centre will also present for the first time the story of the Castle and its 2000 years of history, offering visitors a unique opportunity to learn about the different phases of the Castle's development from the Romans through to the modern day.